Every woman should learn how to cook two types of meat - a classic roasted chicken and a juicy steak. I know these things can be intimidating when you first set out to try them, especially if you're cooking it for the man in your life, but the great news is there is a science to it. By following simple guidelines and using just a few ingredients, you can make the perfect steak every time. Step 1: You have to start with the right cut of beef to get the tastiest steak. To me the most important thing is finding a steak that is 1-2 inches thick, because I love my steaks medium rare. Next I look for a little marbelization. 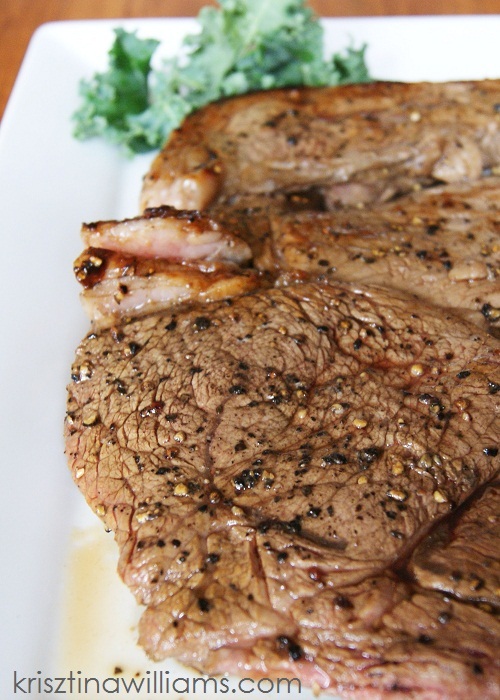 You want some fat throughout the steak for better flavor, but not too much. If a steak has too much fat, it's bound to have a lot of gristle, which will make it chewy. Now check the color of the beef. You want pink or red - not brown. You also have to pay attention to the cut. Certain parts of the cow are naturally more tender and make for a better steak. Cuts that make a great steak are T-bone, strip steak, filet mignon, and even top sirloin. 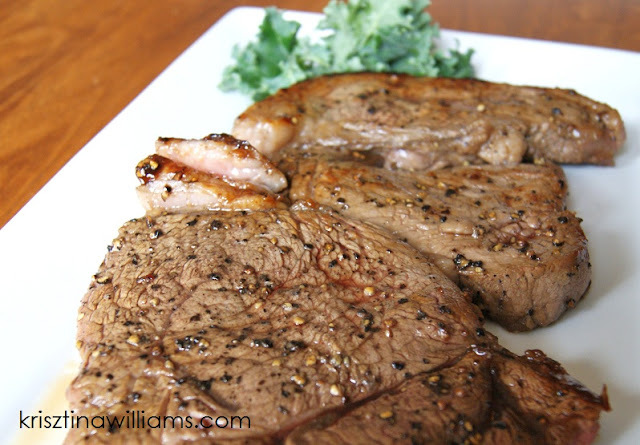 I used top sirloin for this recipe because it's more affordable. As long as you marinate it, it'll turn out nice and juicy. Step 2: It really helps to marinate a steak if you use something acidic (anything containing vinegar). The acidity helps break down the meat, creating a more tender steak. I love using worcestershire sauce with black peppercorn. *Note-if you are going to apply the sauce as an overnight marinade, mix the sauce with half water, because it has a very strong flavor. Coat each side with the sauce then use a grinder to coat eat side with freshly-ground peppercorn. Plain black pepper flakes will not give you the same result. You really want varying sizes of crushed peppercorns. Use your fingertips to press the crushed black peppercorns into the meat, then generously sprinkle each side with salt. Step 3: If the steaks have been marinating overnight, let them come to room temperature before you place them on the grill or pan (use nonstick surface). This helps the steak to cook evenly. Heat the skillet or grill on medium high. If you're using a lean cut of beef like fillet mingon, you'll need a bit of oil or butter in the pan, but if you have a cut that has a fair amount of fat, do not use oil. The fat from the steak will create plenty of grease. The pan should be hot before you place the steak. You want to here a sizzle when you put the steak on the pan. To get a well-cooked steak, it should only take a few minutes per side - about 2-3 minutes per side for rare, about 3-4 minutes for medium rare, and 5-6 minutes for well-done. If you have a huge 2 inch+ cut of beef, it may take a few more minutes. Serve these with some simple baked potatoes. For an appetizer your man will love, try my Bacon & Blue Cheese Stuffed Mushrooms, then finish the meal with this Hershey's "Perfectly Chocolate" Chocolate Cake. Enjoy! I'm ravenously hungry just looking at that! Sounds good but I save my money for ribeye. I like the peppercorn marinade though. Sounds good. Krisztina, I might just run out to the store and get me some steak! It reads like a NOM! meal.